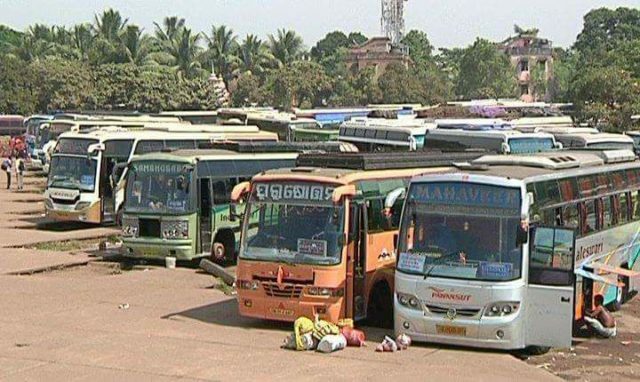 Bhubaneswar: Odisha private bus owners’ association observes state-wide indefinite strike from today .More than 17,000 private buses of the state to stay off roads as talks between operators and State govt failed. Private bus operators on Tuesday held discussions with Transport Minister Nrusingha Charan Sahu, they decided to go ahead with their decision for an indefinite State-wide strike from Wednesday morning. After an executive body meeting of the bus owners’ association, its secretary Debendra Mishra told reporters that they finally decided to keep their vehicles off the roads from Wednesday morning. It should be noted that the private bus owners have been demanding toll exemption, clarity on route map of JNNURM city buses and also rollback of hike in motor vehicle tax among others. However, the government has not kept its words despite assurances, the bus owners alleged.